I didn’t work the end of April for the first time in a few years. 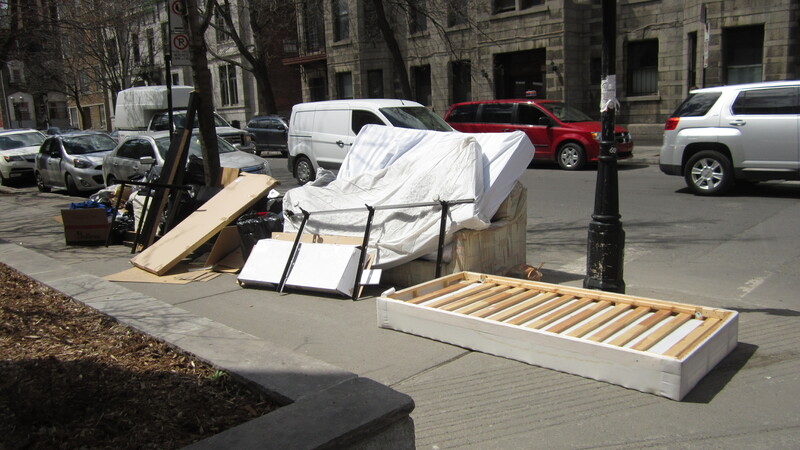 I previously held a regular temp job – basically doing small moves in the McGill area – that used to keep me very busy the second half of April and first few days of May. 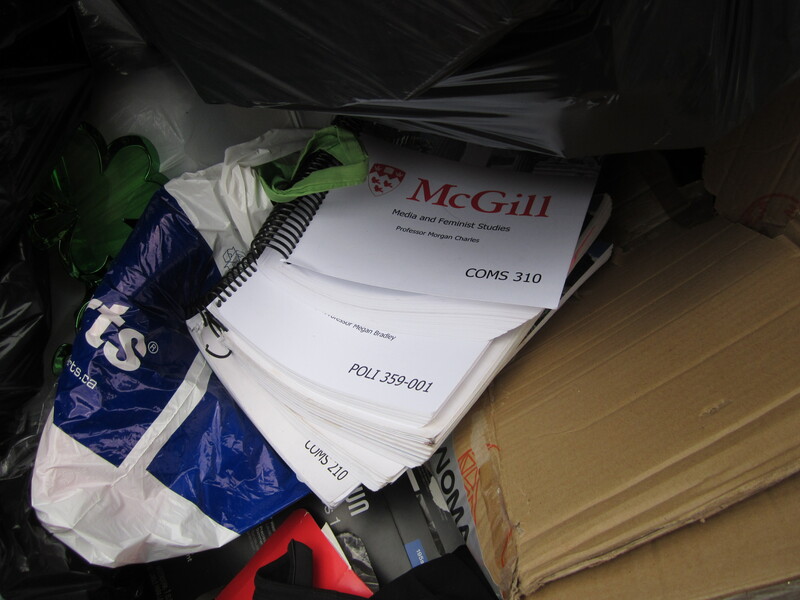 The job helped me make a bit of extra cash, but it also meant I didn’t get to fully experience the phenomenon that is the McGill University move-out day. I’m glad I was able to go this time around, if only so that I could capture the experience as best I could and share it with you! 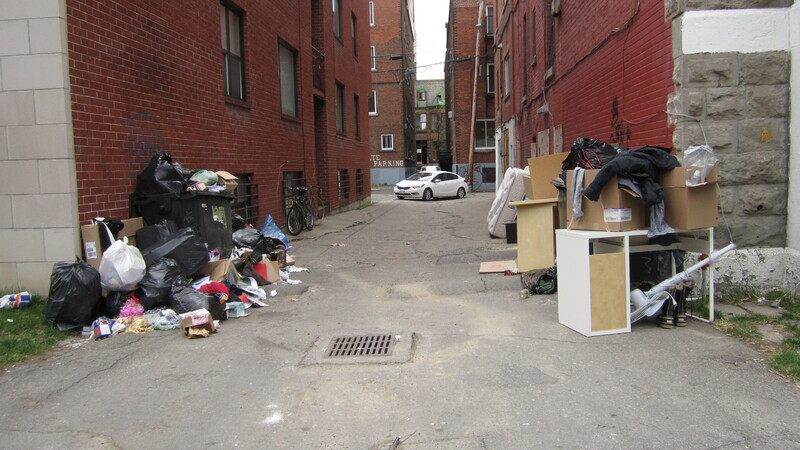 Many students move away from the Milton Parc area (more commonly known as the McGill ghetto) when school ends for the summer. Some go back home for the summer, while others just upgrade to nicer apartments. 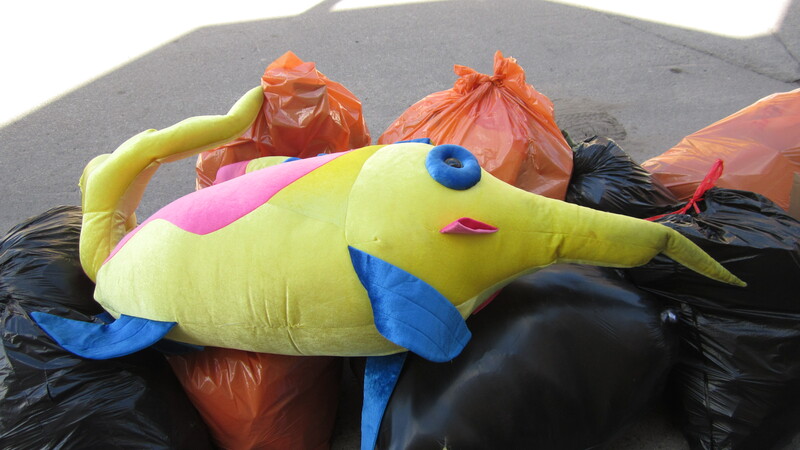 Regardless of why they leave, the exodus results in massive amounts of trash. From what I hear this situation isn’t unique to McGill, and occurs in university towns all across the world. 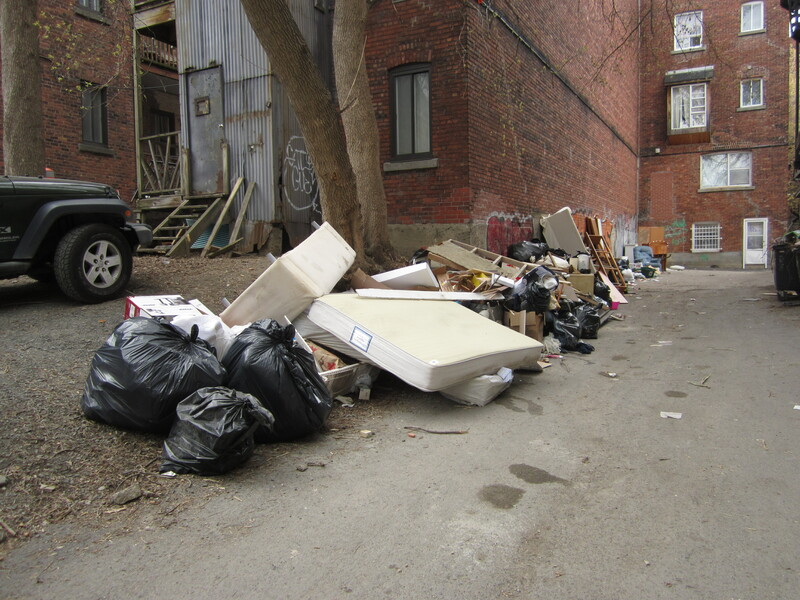 Move-out day one the most well-known trash days in Montreal, second only to Moving Day (July 1st) which often receives international media attention. There’s a lot more competition due to the day’s somewhat underground fame, and various types of scavengers descend upon the area. I saw a couple people, including a woman probably in her 60s, picking for cans. One man who I remembered from previous years walked around with a bag that held some wires, a modem, and a few other things I couldn’t make out. He asked what I was looking for. “I don’t know… iPhones!” I said after thinking about it for a second. He was looking for electronics. 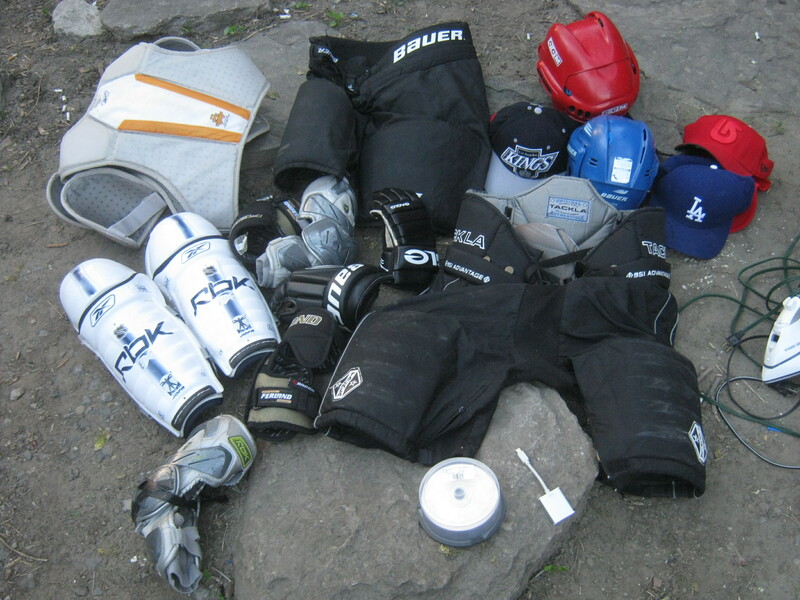 There was a guy a few years younger than me stuffing things in a large hiking backpack. 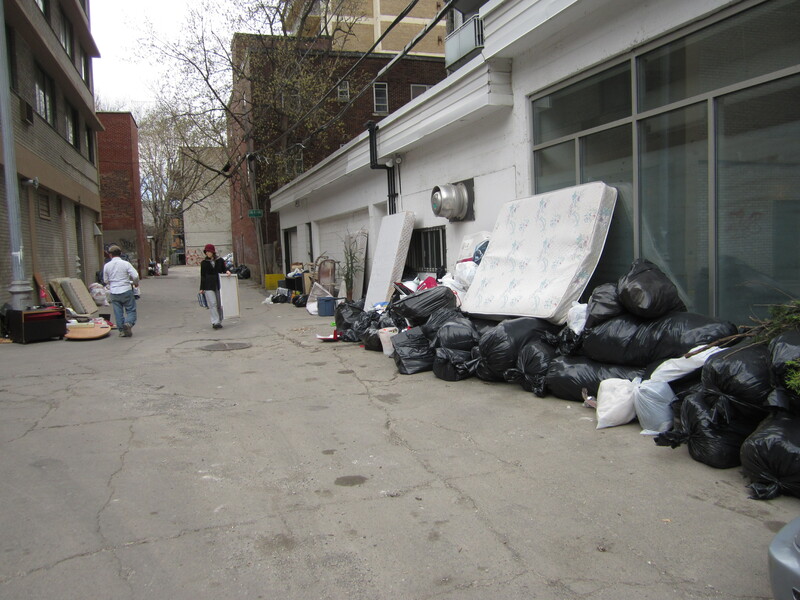 Another person peered at the huge trash piles while carrying a painting and a little Ikea push cart. 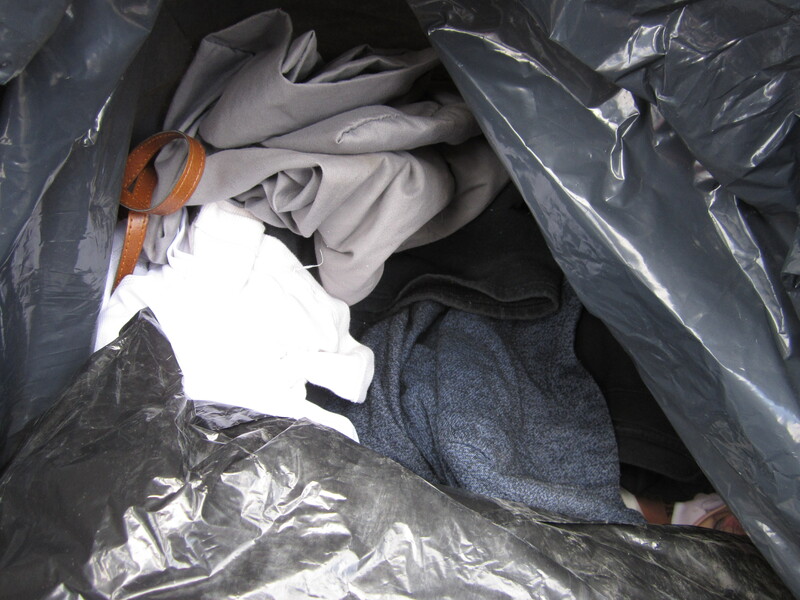 I saw someone else put a bag of clothes in their car. 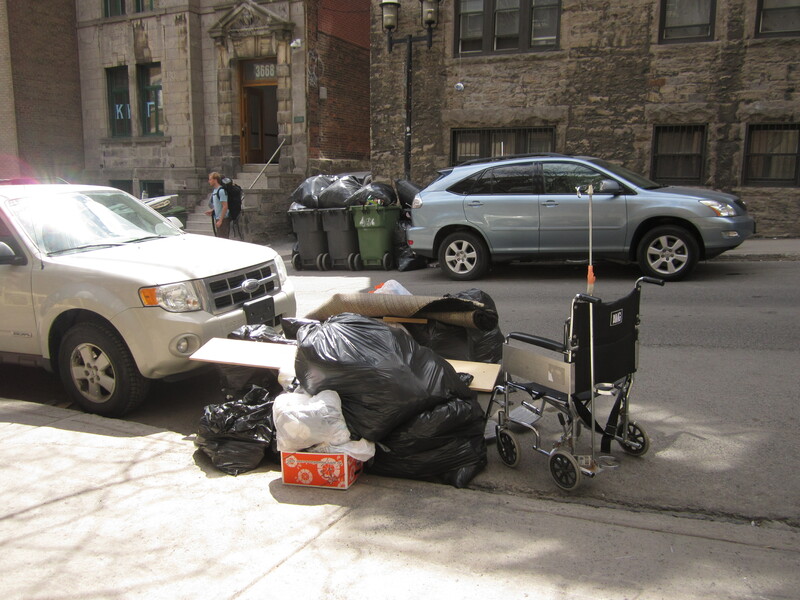 A man came by and threw this wheelchair into his pickup truck not long after I snapped this photo. I imagine he wanted it mostly for the scrap metal. I saw another scrap metal collector working the area with both a pickup and a trailer. 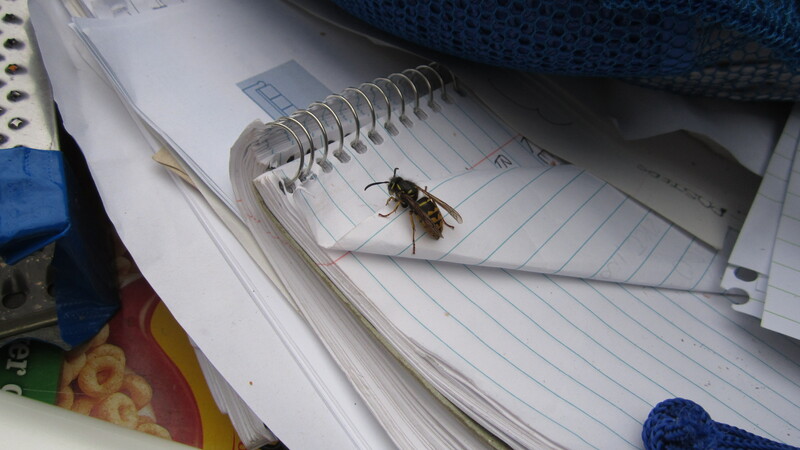 I also saw my first wasp of the year. It’s a scavenger too, I guess. Squirrels, cats, and raccoons (closer to the mountain) also enjoy the spoils. While there’s definitely a lot of good stuff to be found, I personally don’t take move-out day too seriously. 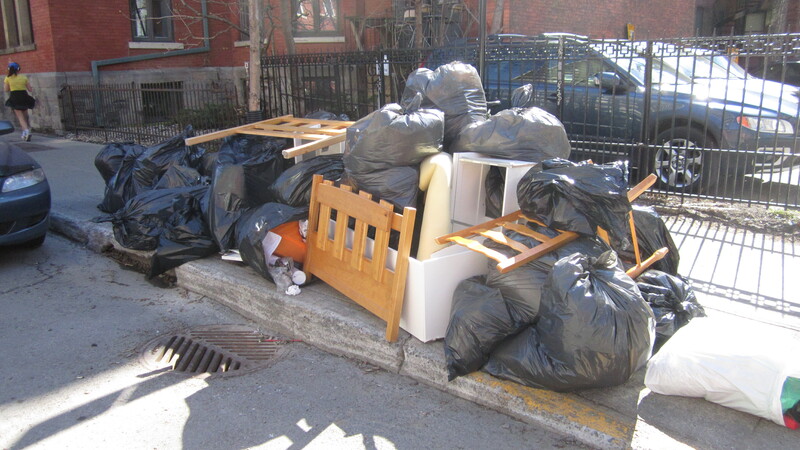 The increased competition makes it harder to find anything that’s really worth the effort, and it’s definitely true that a lot of what the students throw out is pure junk. From a business perspective, I’m better off continuing on my usual routes. Lots of other people move at the end of the month too. Still, move-out day is a fun experience. There’s just so much going on. There are parents packing their cars full of their kids things, students walking pieces of furniture down the street, moving companies doing their thing, janitors and other workers trying their best to maintain order, and scavengers searching for whatever it is they’re most keen for. The ghetto becomes uniquely vibrant, and you kind of feel like you’re part of something bigger than yourself. 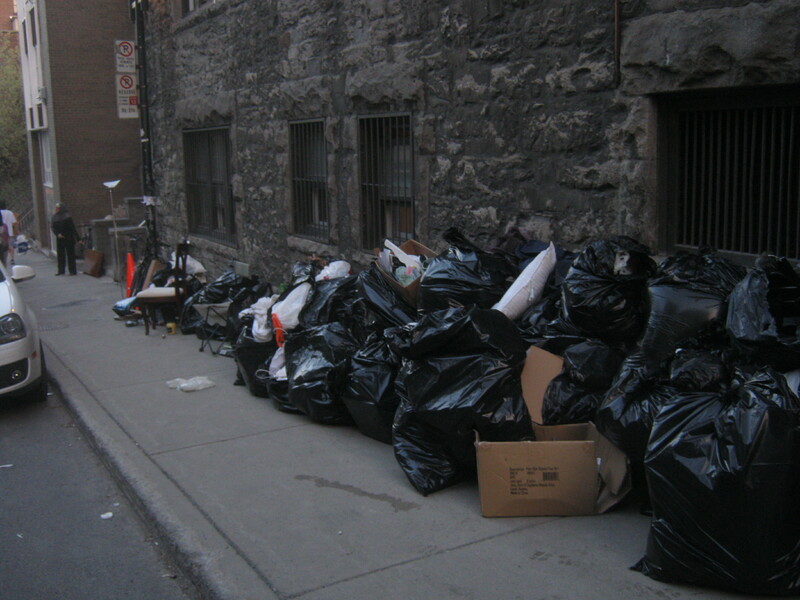 It’s nice too that garbage picking is totally normalized, if only for a day or two. 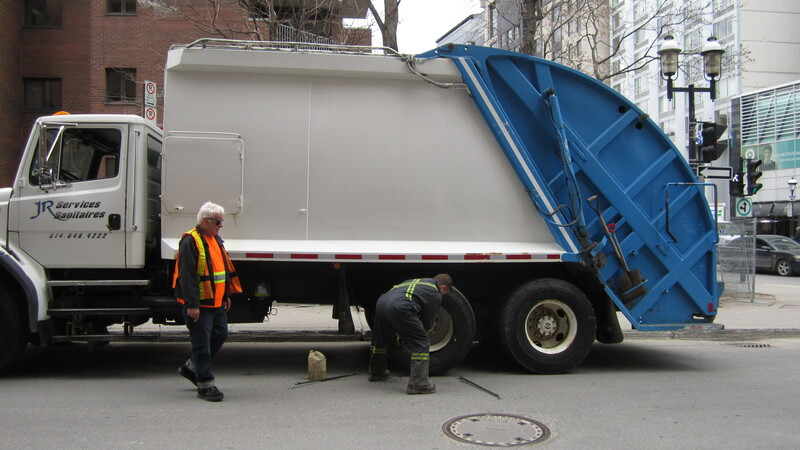 The garbage truck apparently got a flat tire, which I’d never seen before. That almost certainly contributed to the high level of chaos, but likely helped the scavengers save more than they would have been able to otherwise. 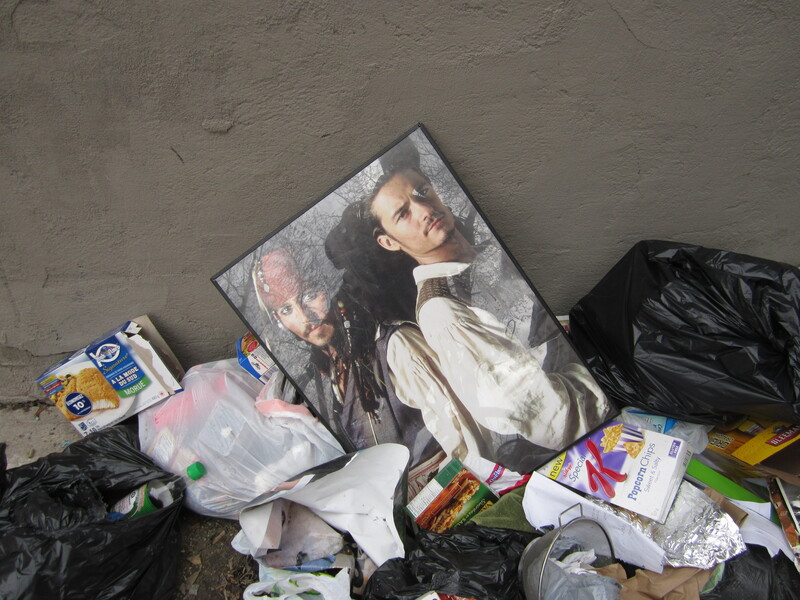 Move-out day has its own particular brand of garbage. It’s similar to the kind of stuff people leave behind when they move far away, but different because there are thousands of almost exclusively 18-20 years old students moving at the same time. There’s a lot of Ikea furniture, as you can imagine. 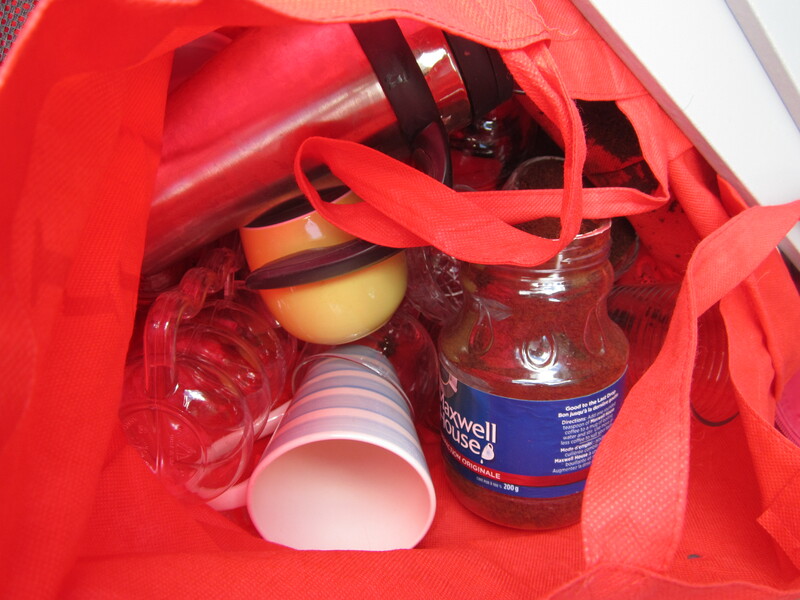 So many bags are filled with whatever was left in the refrigerator and pantry. 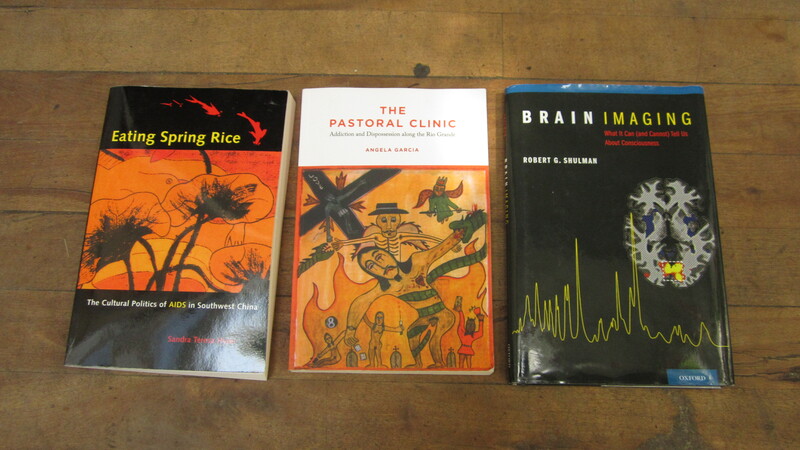 … as do course packs and books. 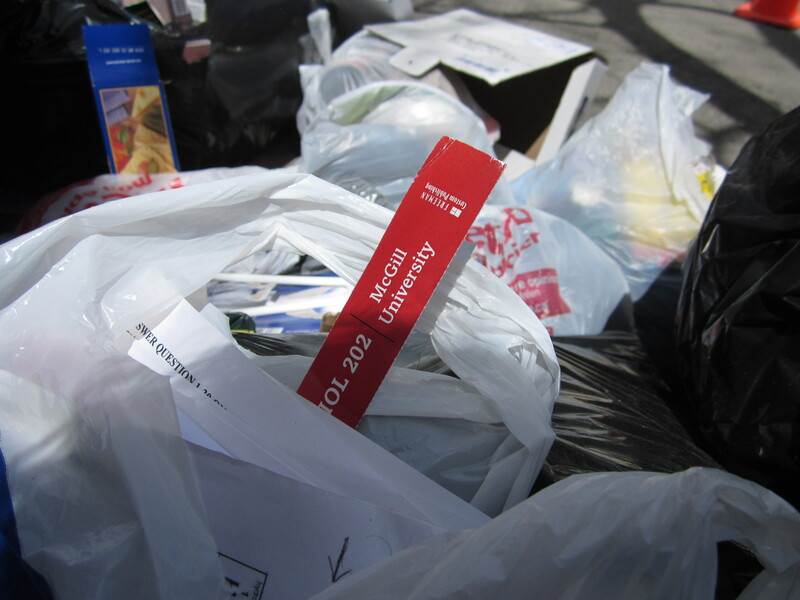 The concept of recycling seems to take a back seat on move-out day, though I can’t say this tendency is unique to McGill students. 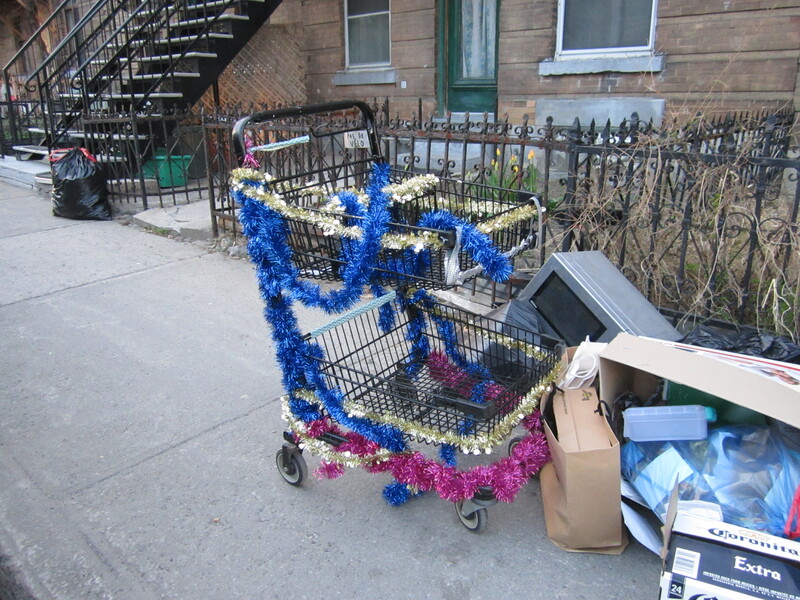 … and a shopping cart adorned with tinsel garland. 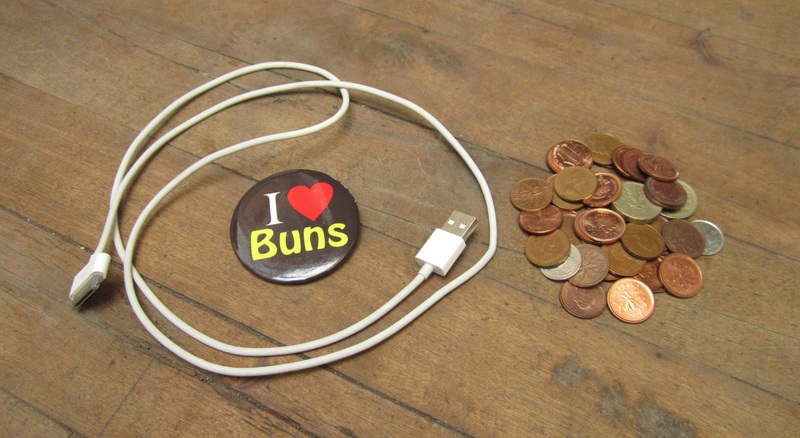 … some loose change, an iPhone cable, and a dumb pin that states “I heart buns.” I actually needed an iPhone cable, so that was handy. 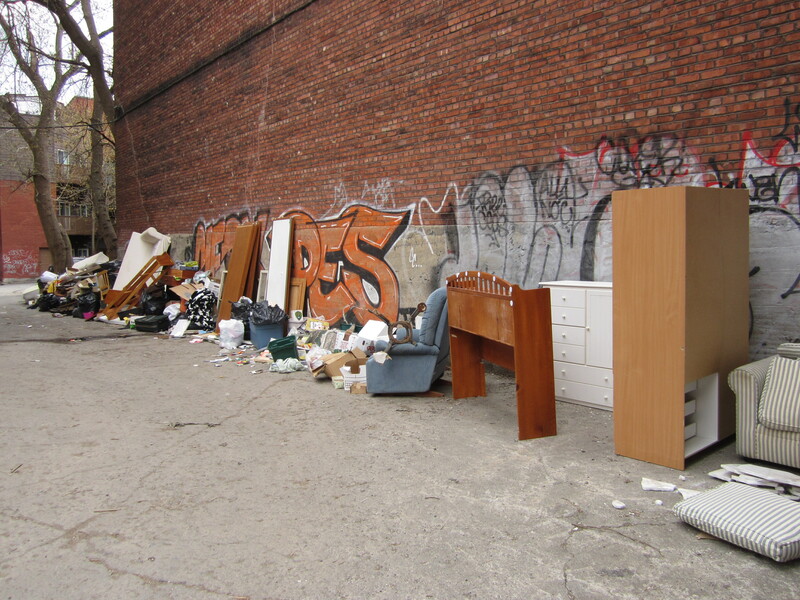 A lot of useful things definitely met their demise in the ghetto the past few days in spite of the many scavengers working the streets. Binders, for example aren’t really valuable enough to take on a large scale, but are often in good enough condition to use again. The same is true for mugs, plates, other kitchenwares, and clothes. 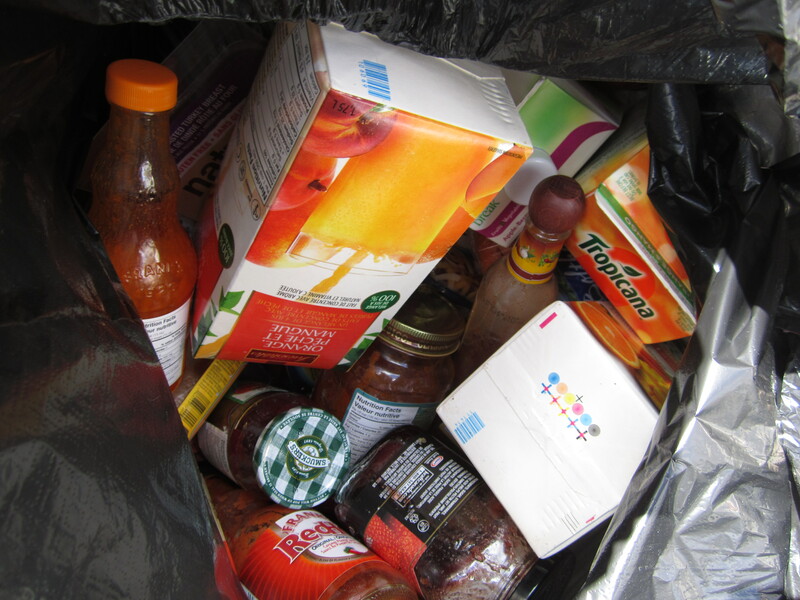 Leftover food, such as a half-full bag of macaroni noodles (a common sight in the ghetto) or half-used spices are still quite safe for consumption but not worth scavenging if you’re hoping for a bigger score. I know McGill has some programs, particularly in their dorms that encourage students to donate what they can. However, this doesn’t apply to people living outside of dorms, and from experience I can say that a lot of good stuff still gets tossed at dorms as well. 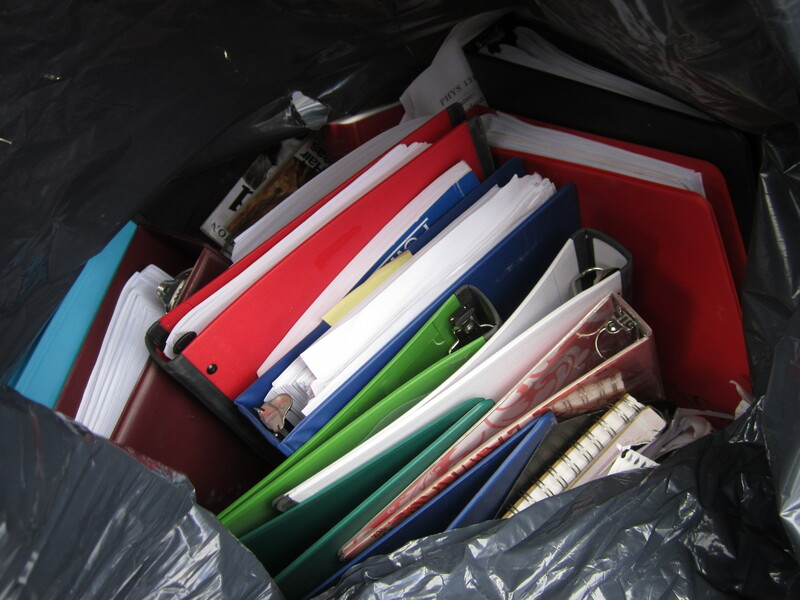 Is there a way we can get students to better reduce, reuse, and recycle? If you’re a student, does your university have a successful strategy for tackling this issue? I’d be interested in hearing your ideas! 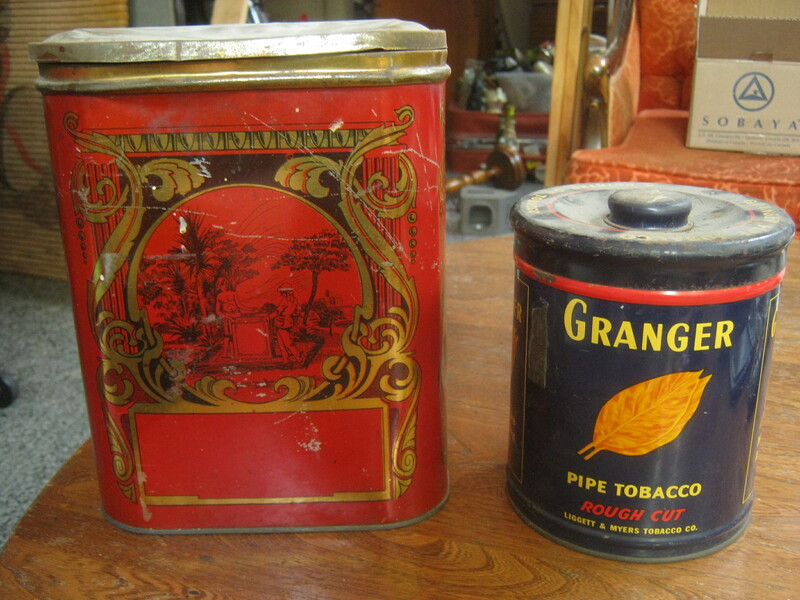 I found these tins on Canada day along with the silver plate candelabra and antique hanging lamp. 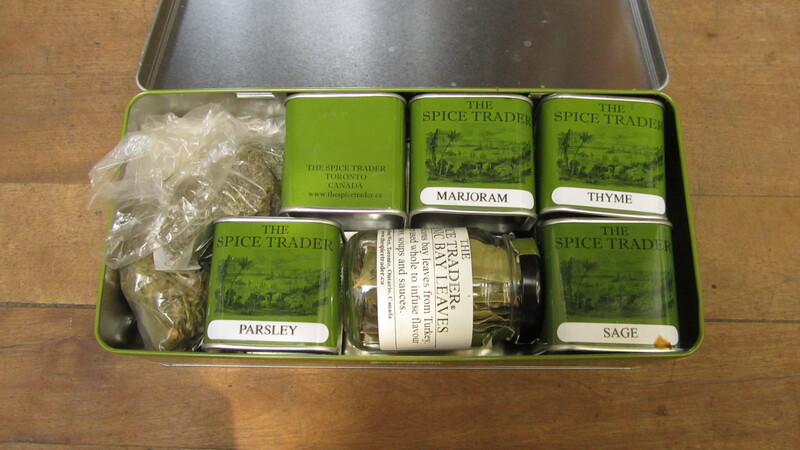 I brought them home without looking beyond a cursory glance at what was inside. These Granger pipe tobacco tin was full of these brass (?) things. Some of the circular pieces have two little wheels and some don’t. 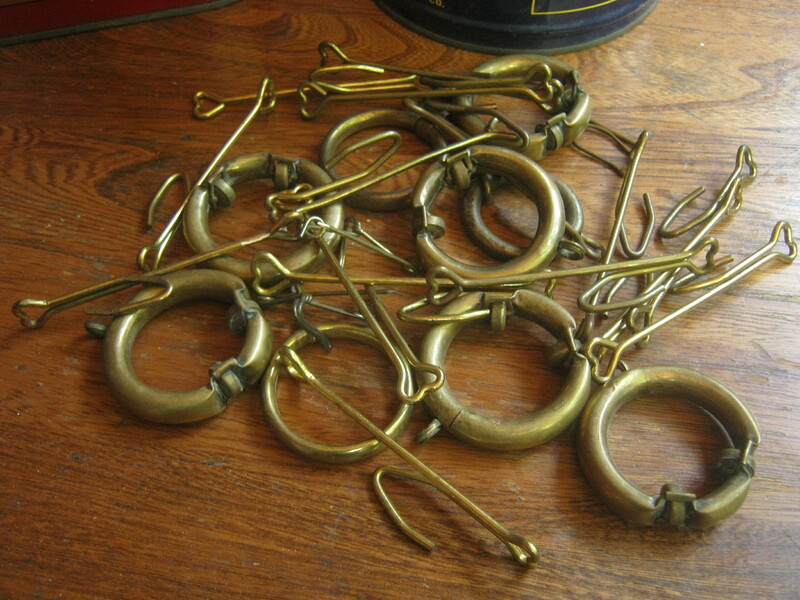 There’s also some wire pieces that may be for hanging the circular parts. Any ideas as to what these were for? FYI, I found a great tool for identifying mysterious items. It’s a Reddit messageboard called “What is this thing?”. I’d recommend it if you want to know what something (including plants you may see, animals, etc) is. 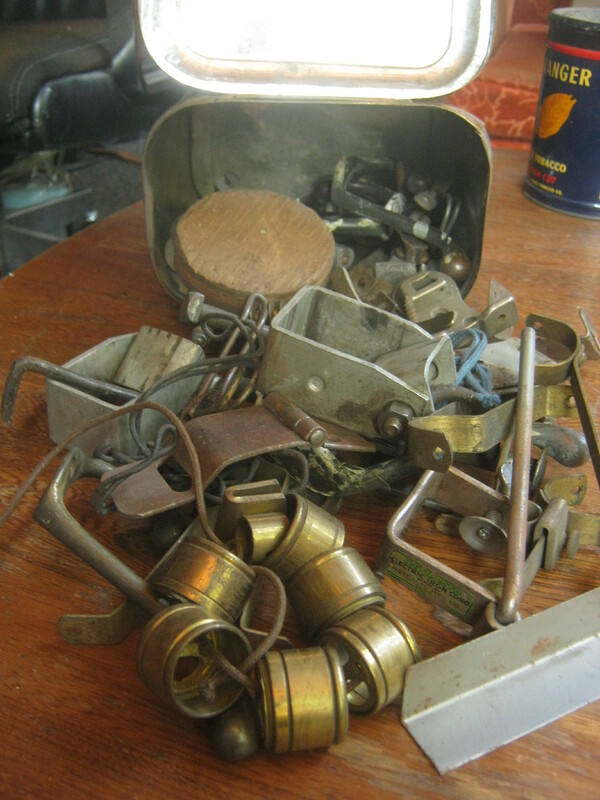 The bigger tin, marked as being made by the MacDonald Mfg Co. out of Toronto, contained a more diverse portfolio of bits and pieces. The tin is pretty old, I would guess it’s from the 1920s. This piece stuck out from the rest. 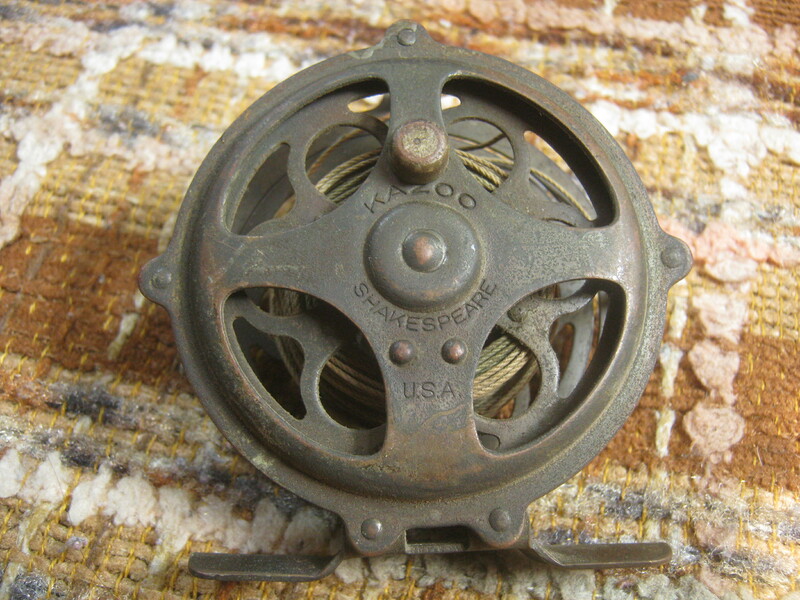 It’s a Shakespeare “Kazoo” fishing reel and it’s definitely an antique, though I’m not sure exactly how old it might be. It seems to work fine. These generally sell for between 10-15 dollars on Ebay, though I’ll probably just put it in a future yard sale. Selling things for that little online is generally more stress than it’s worth. I found this patch along with some other not particularly noteworthy things in some trash bags near my place a few days ago. 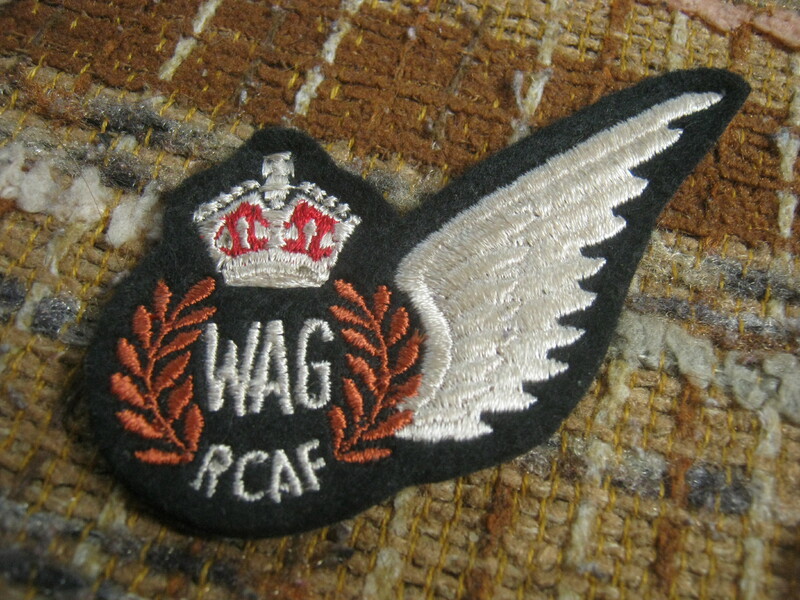 I decided to Google it last night and found out that it’s a WWII-era patch for a wireless air gunner (WAG). I can’t imagine what that job would have been like! It seems to be worth around 10-15$ on Ebay, again falling into that “is it worth bothering” range. Regardless, it’s always interesting finding military stuff. I went to the bike co-op early this afternoon. I trued my wheel and did a few other minor repairs. It runs nicer now but the bump on each revolution of the back wheel remains. My theory now is that the bump is a result of a sizeable dent on my wheel, which may protrude upwards misshaping the wheel. I might be able to hammer that out but I may also have to buy a new wheel. My Sony DVCAM player finally sold for 135$. Previously I had sold it to someone in Italy but the shipping was astronomical and the deal fell through, which was sort of lucky because I managed to get a better price the second time around. 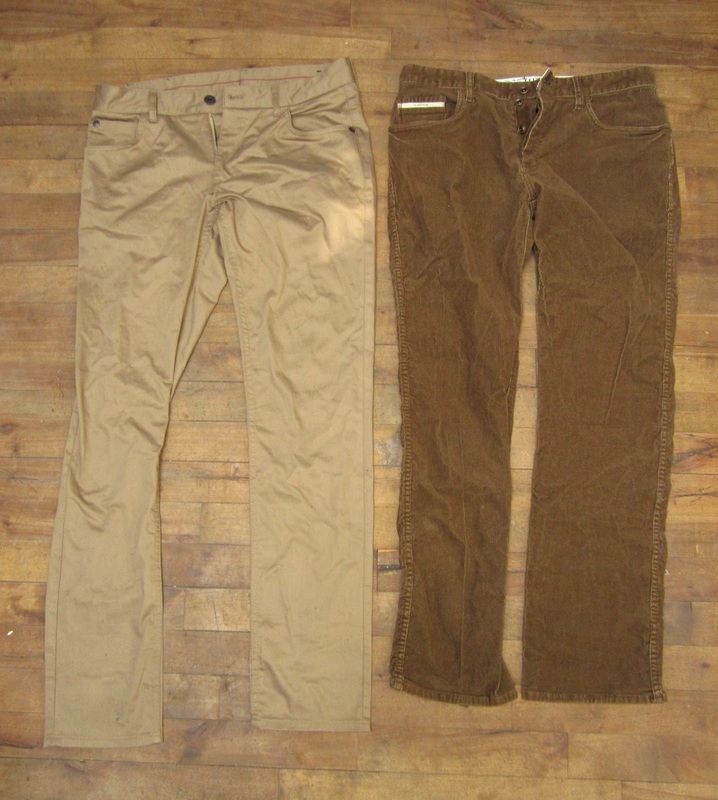 One thing I think I’ve learned about Ebay is that fixed price listings are often the best choice. It may take a little longer but I find that you can make more money that way. Auctions are good when you have something and you’re not exactly sure what you can get for it, but overall the fixed price listing forces the extra motivated buyer to pay a little more to get what they want. I also had to cancel a sale (of a textbook I found in November, the last of 6) because the person was in Australia and the shipping was too high. They wanted me to ship the cheapest way (22$ via surface) but that’s notoriously unreliable and leaves me very vulnerable to fraud. I cancelled the transaction and it sold again, but this time the buyer claimed that they thought the shipping would be free, so that’s likely to fall through as well. It’s important to note that this last textbook is only still around because someone bought it near the beginning of the winter semester, but then never paid for it and disappeared for a couple of weeks. I cancelled the transaction and didn’t lose any money, but by then the semester had started and the demand for the book had plummeted. The guy emailed me far too late telling me he had bought one somewhere else, to which I had to resist telling him I didn’t give a damn. These are some of the reasons I find selling online more trouble than it’s worth sometimes. I think going forward I will limit most of my items to the US and Canada, which are generally my biggest customers regardless. Anyways, I’m going to go out and enjoy this sunny day, and perhaps later enjoy some music at Jazz Fest.